The murderous marionettes are on the march! PUPPET MASTER: THE LITTLEST REICH, brings the kills, thrills and spills in the bloodthirsty reboot of Charles Band’s classic horror franchise from co-directors Tommy Wiklund and Sonny Laguna (Wither, Blood Runs Cold) and writer S. Craig Zahler (Bone Tomahawk, Dragged Across Concrete). 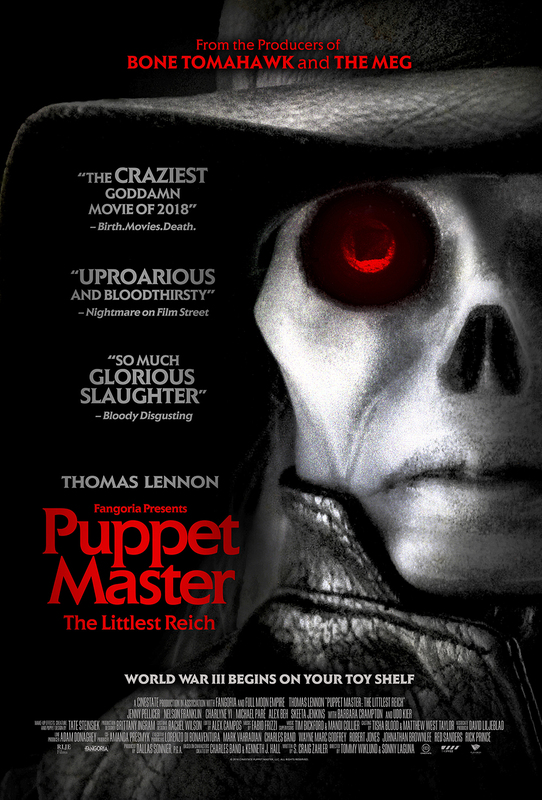 PUPPET MASTER: THE LITTLEST REICH stars: Thomas Lennon (Night at the Museum), Jenny Pellicer (The Bridge), Nelson Franklin (The Office), Charlyne Yi (Knocked Up), Michael Paré (Bone Tomahawk), Barbara Crampton (Reanimator), Udo Kier (Suspiria) and Skeeta Jenkins. Directed by Tommy Wiklund and Sonny Laguna, written by S. Craig Zahler and produced by Dallas Sonnier (Bone Tomahawk, Brawl in Cell Block 99) and Amanda Presmyk (The Standoff at Sparrow Creek). FANGORIA presents PUPPET MASTER: THE LITTLEST REICH in cinemas 19th April 2019. You can read our review of this film and the whole PUPPET MASTER franchise by clicking HERE.